Enjoy delicious dim sum at any time of day! 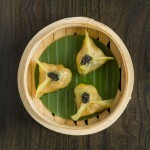 Delicious, delicate dim sum – steamed, baked or fried savoury dumplings – are traditionally enjoyed at lunchtime and as you would expect, we of course offer a superb complete dim sum menu daily from 12-3 in addition to our a la carte as well as including dim sum in our new set lunch menu. 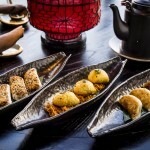 Specialities such as our baked Wagyu puffs, Shanghai-style xiao long bao or Ginger and spring onion lobster buns are perfect as a starter or enjoyed as a meal in themself. But such is the popularity of our dim sum that we make sure that a selection of the most popular varieties is available at other times too. On the a la carte menu there is our ever-in-demand dim sum platter, two each of four different dim sum including Rosé Champagne shrimp, Vegentable and bamboo pith, Crystal crab meat and Scallop and pumpkin. More dim sum are served in larger-than-usual portions – six pieces instead of the more usual three or four – among them Minced pork dumplings in hot and sour sauce, Poached won-tons with garlic-chill sauce and Mixed vegetables dumplings. These substantial portions are perfect for sharing among larger groups. 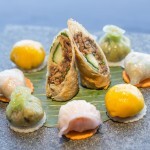 Finally you’ll find a selection of dim sum is also available daily from 1pm to 5pm, in the Shanghai Bar, ideal for enjoying a light but filling bite to eat with one of our many cocktails. Why not try some XO sauce crystal prawn or Scallop prawn and kai lan dumplings, or perhaps some of our indulgent Crispy duck spring rolls?